Hi, I am interested in your 1978 Chevrolet Corvette (stock #0760-NSH) listed on Autotrader for $16,995. I'd like to get more information about this vehicle and confirm its availability. 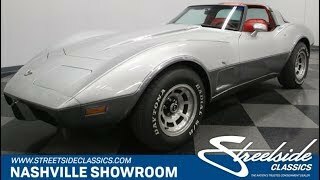 This 1978 Chevrolet Corvette 25th Anniversary has sustained its desirability well after Americas sportscar celebrated its silver anniversary. With two tone paint, beautiful red leather interior, T-tops, manual transmission, and its original V8 under the hood, its a great Vette that will get you into all the big events, and put a smile on your face every time you crack the throttle. 1978 was the first year of the C3 fastback styling, and combined with the two-tone paint, the results were a home-run. This commemorative coupe is less known than the gray/black pace cars, but the two shades of silver, separated by a pinstripe has a monochrome level of cool that still turns heads today. In fact, what makes this coupe so cool is that the silver theme went well beyond the paintjob. The factory wheels almost make this look like a three-tone silver on the car, and real enthusiasts flock to see the shiny 25th anniversary badge on the hood. Red leather originally came in less than 1 out of every 10 Corvettes in 78, which is why its so nice to see this factory-correct interior in such amazing condition. Even the drivers seat looks barely broken-in. The other benefit of this vivid red is it makes you feel like a bull being charged forward. So it feels great to just to sit down and grab the three-spoke steering wheel with your left hand and row through the gears with your right. But, for those times when you just want a mellow journey, this Corvette also obliges. It has a long list of desirable factory comfort features that includes, power windows, power locks, tilt/telescoping steering wheel, and even the original AM/FM stereo with the 8-track player still providing groovy tunes. But what you really want to do is open up the T-tops and just have a great ride as the wind whips through your hair on that sunny day. The original, matching-numbers 350 cubic inch V8 still lives under the hood. It appears as it left the factory, right down to the blue paint on the valve covers something Corvette shows love to see! Overall, the cleanliness of this engine bay is proof of how much care has been taken over the last 37 years with this celebratory Corvette. But, were not too surprised about the condition of this coupe, because the 25th Anniversary cars were seen as one of the first true collector Corvettes straight out of the factory. Since this one averaged less than 2,200 miles per year, it shows all the hints of enough driving to keep this coupe healthy, without becoming a high-mileage car. We suggest practice at least the same level of maintenance through road use, just like every classic car. Besides, this Vette has all the right features to take the long way home with its smooth V8, four-speed manual transmission, power steering, and four-wheel power disc brakes. This 1978 Corvette is an investment that begs to be driven. It doesnt get much better than that. Dont wait, call today! !